Paper Tiger System to File & Find Your Stuff | Emphasis on Excellence, Inc. If you have files, notebooks, papers, boxes, envelopes, albums, and other “stuff” all over your office or home and you are tired of wishing you had a good filing system, it is time to download and learn with this free webinar about using Paper Tiger Software. I am able to use Paper Tiger in a most efficient way. I’ve been able to clear out lots of old files and implement the PT system allowing me to consolidate a lot of information into fewer file folders. You will be taken to my secure shopping cart. Your registration will be acknowledged immediately by email and you will receive the links to the recording and handouts for this engaging and informative presentation. Meggin is clear and effective. I especially like the pictures of her own office and files to show how she uses the materials. I always tell them: Use Paper Tiger! The simplicity of the program is exactly what I am looking for. The cost is reasonable and the fact that I can use it for home and office is an added bonus. I have already recommended Paper tiger. I think people will be pleasantly surprised at the ease of setting up Paper Tiger. I know I was! Download of the class to watch and listen to anytime at your leisure again and again to reinforce your learning. An extensive packet of handouts to download and review while you are learning. Meggin creates a picture in your mind and enables you to see the possibilities. Meggin makes trying something new fun not scary! Do these filing issues sound like you (or someone you know)? Your filing system is a mess. You can’t find something you know you filed. You’ve simply abandoned certain file cabinets because they are jammed full and you refuse to deal with them. No one else can file for you (or find anything that has been previously filed). You have notebooks on shelves (LOTS of notebooks) and you are not positive what is in many of them (and couldn’t find it even if you knew). Get started using Paper Tiger to get organized and reduce your stress. Paper Tiger Software (which you can check out using the link below) has both a “cloud-based” and a “desktop” version. They function the same, it’s just that the access varies. 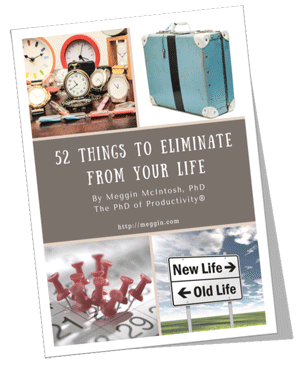 Meggin is practical, makes the topic accessible, applicable, and relevant. Get Paper Tiger Online. The Simplest Filing System in the World! **This is my affiliate link, which means that Paper Tiger will send me money if you sign up through me. I give all the affiliate income I receive from the handful of products I recommend to Kiva.org or DonorsChoose.org. You pay exactly the same if you use an affiliate link as if you don’t, and I love being able to give away more money. 🙂 Just wanted to let you know. As always, Meggin is approachable, easy to follow, and very personable. Did I say she’s motivating and helps people just feel good afterwards? When I was the Director of the Excellence in Teaching Program at the University of Nevada, Reno, our office manager, Karen, was out on emergency medical leave for 3 months. The office came to a screeching halt, at least as far as filing or retrieving files went. It was not a pretty sight. Karen had a system that worked for her…but the rest of us didn’t know that system. You may be part of a “system” like that, too. When she got back, I said, “Find something that works for filing because we can’t have this situation ever again.” I said it nicely, of course. 🙂 She did the research and found Paper Tiger Software. I figured, what the heck? We ordered the free trial, and never went back to our old system. In short order, we redid our office filing system and then I bought another copy and redid my home office, too. After over 13 years, I am still happily amazed at how quickly I can file & find things. I would recommend this class. I think it’s important to be organized, but I still don’t know why I am not as organized as I would like to be. I mean I have some suspicions… but this webinar definitely gave me answers and then led me to the questions. I like information that allows me to be human, but a more organized one. Also, I like that you acknowledge that people do things differently. It’s good to know that you can do a little of something each day and that it still matters and is still progress.